The long teased online component of Metal Gear Solid: The Phantom Pain was unveiled at the Game Awards at the weekend. Between appearances by Kiefer Sutherland and Hideo Kojima, the above gameplay footage demonstrated that yes, brown is still very popular in 2014. Behind the thick patina of brown is a promising glimpse of Metal Gear Online in action. Few details were offered which cannot be gleaned from the footage, but the video does confirm that this will come free with The Phantom Pain. We still don't know when that is releasing, beyond a vague 2015 release window. It's not the first time we've seen multiplayer action in The Phantom Pain: this video shows Snake infiltrating another player's base. 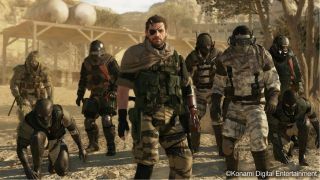 UPDATE: Konami has sent through a bunch of MGO screenshots.